Peacock Color Picker is a color picker that lets you retrieve the pixel color from any picture found over a webpage or any image over your PC. A professional web-designer, graphic designer, or a simple home user can work efficiently over this software. Now, when the Windows 8 has finally released, many of the new software are launching after keeping Windows 8 in mind. Developers are developing in a way that people can use the software in Windows 8 along with other OP. 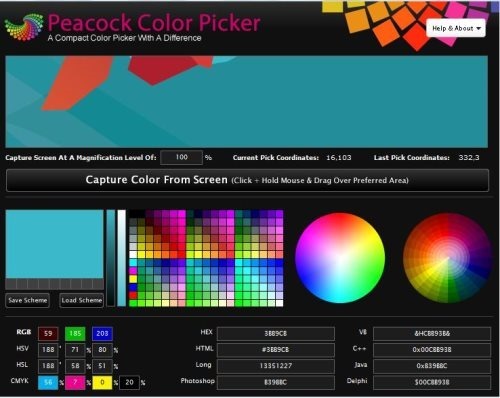 Peacock Color Picker is one of those upcoming and updated software. The color picker for Windows 8 is available. No matter which OP you are using, just download it and start working. The main motive is to define the actual design of drawing. You can also dream about the fascinating colors created by RGB (Red, Green, Blue) values with their proportion mixture. This makes it a perfect color picking solution for graphic designers, webmasters and home users. Huge creation of color mixing palettes. Available with color scheme analyzer. You can even manually adjust the RGB values. Import and export color schemes. RGB color values are enabled. HEX color values are delivered. Visual basic colors are also provided. HSL color values are also shown. You can view off HTML color values. Delphi color values are shown. Customized zoom up to 10000%. Also, check out How To Create Virtual Desktop In Windows 8. In order to use color pick in Windows 8, all you need to do is just take the cursor to “Capture color from screen”.Then click and hold mouse & drag over preferred area. The screen gets captured on color picker. Now you have to double click on any part of image captured to extract the preferred color. Extracted color would be shown in a small box. Visit the download link to install Peacock Color Mixer on your PC. An *.exe file would be downloaded to your PC. Double click on the *.exe file downloaded. Follow further instruction to install this free color picker on your PC.